I can?t stop fighting. I wonder if this is a common feeling for prisoners, but in my case it?s literal. No matter how many times I press it, the button to lower my fists and surrender doesn?t do anything, and even though I?m cuffed, the guards still consider me hostile. That?s how I ended up unconscious and in the infirmary; the door to my cell in solitary opened, an armed guard saw me restrained and stationary inside, and immediately shot me twice in the chest. This was a concern, at least until I pulled the greatest escape of all. I vanished. 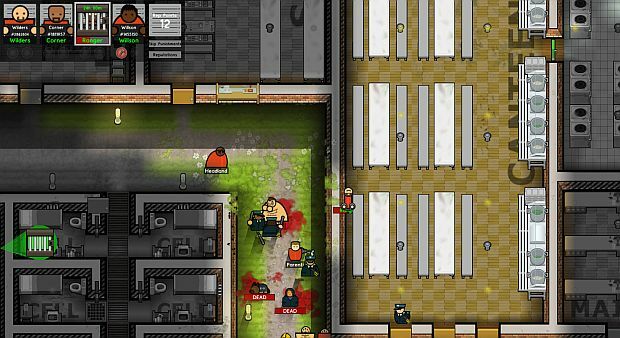 Prison Architect?s escape mode is compelling, but not without its problems. 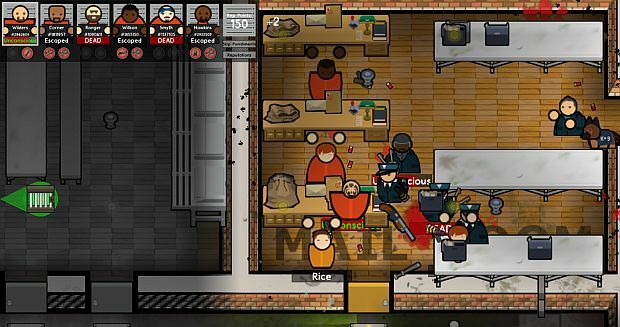 Escape Mode flips the prison building and management simulation on its head, putting you in control of a single prisoner within a jail rather than the architect of the facility?s systems. You earn reputation points through acts of criminality ? destruction of property, beating people up ? which can then be spent to unlock traits for your character. Among others, those traits include Deadly, which gives you a percentage chance to kill a person with a single strike; Instigator, which increases the likelihood other prisoners will join in with whatever ruckus you create; and Quick, which helps you to outrun pursuing guards after whatever terrible deed you?ve just committed. Gain enough reputation points and you can then also recruit other people to your crew, ordering them to follow, controlling them individually as desired, or possessing them in lieu of a Game Over should your current wrongdoer be killed. Other than this, the game?s simulation is mostly unchanged. As you wander around a prison with WASD, guards will still patrol as before, prisoners will still follow their routines, and riots will break out should the seeds of dissatisfaction be spread too far and wide. It is exciting, in the way Dwarf Fortress? own Adventure mode is exciting, to know that you are dealing with a simulation robust enough to stand up to multiple genres of game ? at least, in theory. My name is Wilders. I don?t know what crime I?ve committed, but I?m a newly arrived inmate at a high-security prison. I?m told it has three gangs ? the infamous reds, blues and greens ? and that riots are a regular occurrence. But this is not my experience. During the first few days inside, not a single riot takes place. 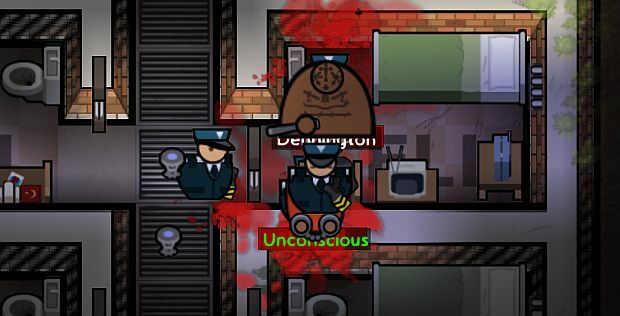 Instead I fill my time by destroying the toilet inside my cell, sucker punching guards and being repeatedly tasered unconscious. Soon, I?ve enough of a reputation to start expanding my crew. An inmate named Corner joins my group, then another named Ranger, then another named Wilson. 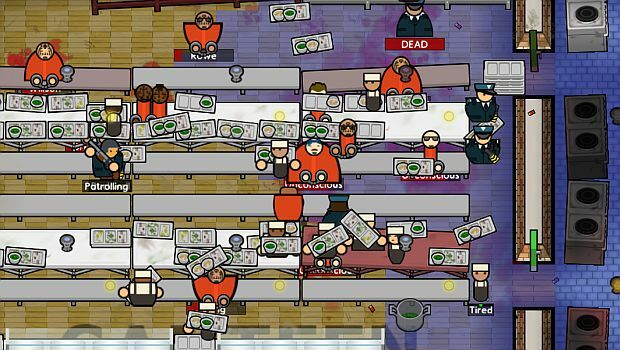 Levelling all these inmates can be a bit of a grind, requiring you to repeatedly create low-level mischief to get reputation points, to spend one of those reputation points to skip the inevitable punishments in a locked cell, and then to start again. But slowly I?m making progress, and as I become Deadly, then a Skilled Fighter, then Tough, the reputation points come more quickly and easily. It helps that a lone prisoner, with no nearby guards or security camera to witness the act, can be assaulted with impunity. You can do the crime without doing the time ? although I feel bad, I admit, that I am simply killing in exchange for points. This strategy reaches its head when I recruit a fifth member to my crew, Smyth. Before I?ve bothered to unlock any reputation traits for him, I use him to start a fight in the canteen. I have time to throw two punches before he is immediately shot to death by an armored guard. 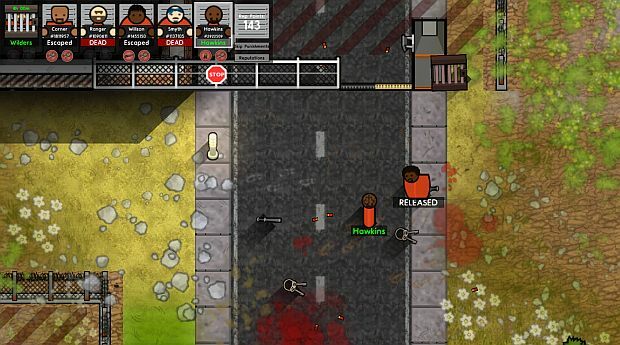 All of Prison Architect?s complicated simulation still being present means that there are avenues other than direct violence. 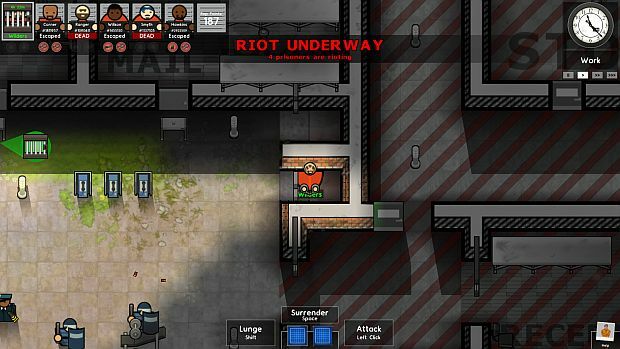 You can sneak inside workshops and kitchens in search of contraband, which you can then sneak around metal detectors and stash in your cell. I take advantage of this fact to smuggle a wooden pickaxe back to my room and, under cover of night, start digging a tunnel underneath my toilet. It takes a long time to dig that tunnel and when I emerge after clearing just four tiles, I am spotted by a patrolling guard and immediately beaten unconscious. Workmen fill in the hole while I serve time in solitary. Next I decide to mix direct and indirect strategies. I use Wilson to beat up a guard and steal his keys, stashing them inside Wilders? prison cell. Then I use Corner to kill an armed guard in a single punch, steal his shotgun, and hide the weapon in a cell neighbouring Wilders?. 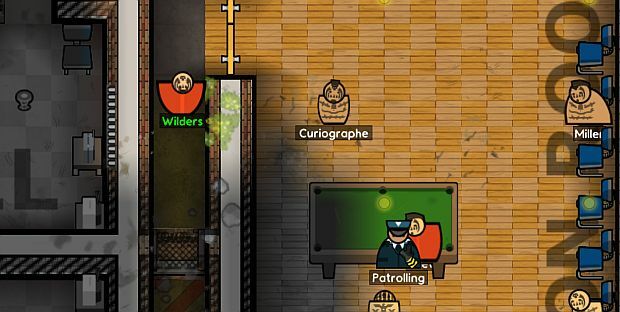 That night, when the cells are locked and everyone is sent to sleep, I use Wilders to take the keys, sneak out of his cell, grab the shotgun, and head into one of the prison?s restricted areas. These are red-striped zones which are designed for prison staff only, and stepping into them as a prisoner is an immediate offence that causes all guards to turn hostile. I?m not making an escape attempt, however. I?m heading toward one of the prison?s power generators. I get inside without being beaten to a pulp and have plenty of time to destroy the generator and every capacitor that surrounds it. In doing so, I plunge a wing of the prison into darkness. 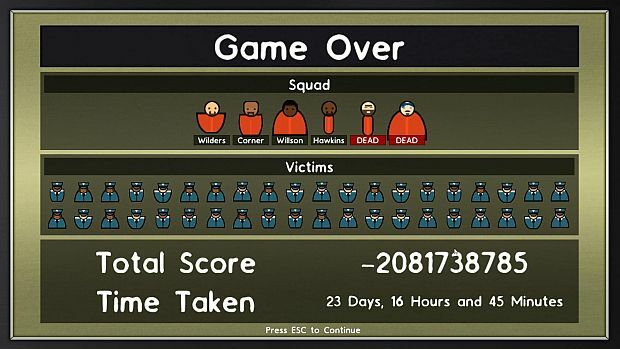 In my time playing Prison Architect?s escape mode, this is my most satisfying experience. It would be better if I could be sure that the riots were the results of my actions, but it?s still good that they could have been a result of my actions. By damaging the generators, I?ve made life worse for my fellow prisoners, thus making them more dissatisfied, thus increasing the likelihood they might decide to raise fists and punch a neighbour in the head. Two days later, during the third riot of my stay, I decide to make a break for it. I don?t even need to commit the violence myself this time. I gather my crew together ? Wilders, Corner, Ranger, Wilson, and new recruit Hawkins ? and I simply wait for the violence to start. When it kicks off, I swoop in, being careful not to hit anyone myself, and grab keys and a taser dropped by a guard. And then I bolt for the front door. The guards are distracted enough that this works surprisingly well. I get through the first locked door as guards open it to come streaming inside. I open the second and third locked gates myself with my stolen keys. It?s only when we?re outside, thirty, forty yards away from the first road gate that Wilders ? my original prisoner, who I?m controlling ? is shotgunned unconscious. Immediately my control switches to Wilson. I grab the keys Wilders just dropped, open the road gate, then the next, and? But the game isn?t over yet. I need to get the whole crew out. So the next day, I try again. Wilders, making a habit of it, is knocked unconscious again, but Hawkins and Corner reach safety. Ranger, sadly, joins Smyth in the morgue, killed only a few feet from breathing fresh air. I?m now back down to just a single prisoner again: Wilders. The guy I started with. Now on my own, I could choose to recruit a new crew to help me escape, but each new addition would simply give me more people I need to get out the front door. As I?ve maxed out all of my reputation traits at this point, I should be able to handle myself without backup. After being healed in the infirmary and spending reputation to skip my punishments, I try again. It?s become routine now: punch guards till one of them drops their keys and taser; grab both and run for the front door; slip through some back rooms for a shorter route towards the outside; once out, immediately sprint south towards the bottom exits and freedom. Everything goes to plan this time and I get through the last gate unhurt. There?s no one nearby pursuing me, and aiming with the taser is easy enough that if anyone comes close, I can easily take them out. I?m sprinting so fast that I?m even keeping pace alongside a vehicle driving on the road beside me. I don?t need to worry about that, because although it appears to have guards in the back, they won?t stop or exit a vehicle once inside, and you can pass through the vehicles without taking any damage. And then, feet from victory, I find myself suddenly, inexplicably in handcuffs. Did one of the guards on the truck spontaneously arrest me, even though I was outside and the vehicle was in motion? I don?t know. But I do know that even though I was in shackles, the game still considered me aggressive. The ?surrender? button remained at the bottom of the screen, encouraging me to press space to end my already-ended assault. I obeyed and received hundreds of reputation points, but the UI never acknowledged my surrender. I kept pressing the button and received thousands, then hundreds of thousands, then millions of reputation points. Then the game took away all of them. My aggressive state didn?t end when I was taken to solitary. It continued all the way through my spell there ? I had no reputation points, so couldn?t skip my punishments. It continued as the largest riot yet took hold of the prison, prompting the arrival of riot police. I could see them briefly as they passed my cell door and hear the shouting and shotgun blasts. It continued as I was taken again and again to the infirmary until, eventually, somehow, it stopped. Which is when I disappeared. 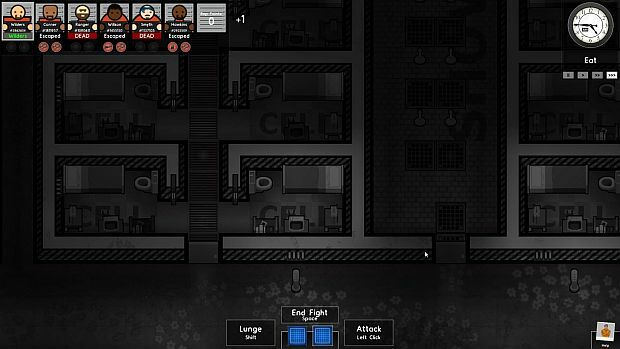 Prison Architect has a kind of fog of war which casts the world your character is unable to see in black and white. Normally this effect recedes slowly when you enter a new room, wiping away the areas outside till all that remains is your immediate surrounding. It?s an attractive and easily readable effect and, when controlling an individual prisoner, feels a lot like the walls are closing in around you at night. But in this instance, the effect kept going past the walls of my cell until Wilders himself disappeared. I could still move around, but I couldn?t see him or anyone else, and the whole world was in black and white. In the morning, when my cell doors opened, I walked outside the cell block and towards the yard. I could see through the black and white mist that a lot of the prison was damaged, but I couldn?t hear any violence happening. Occasionally a door would open, but no one seemed to take any notice of me as I walked through the three front gates when they opened for unseen staff. Or when I walked through the next two gates, which had been smashed to pieces during the major riot. Or when I walked off the edge of the map, ending the game.